And why they make a difference. As any audiophile will tell you, several factors affect our perception of sound quality during record playback. One of these is the stability of the record. 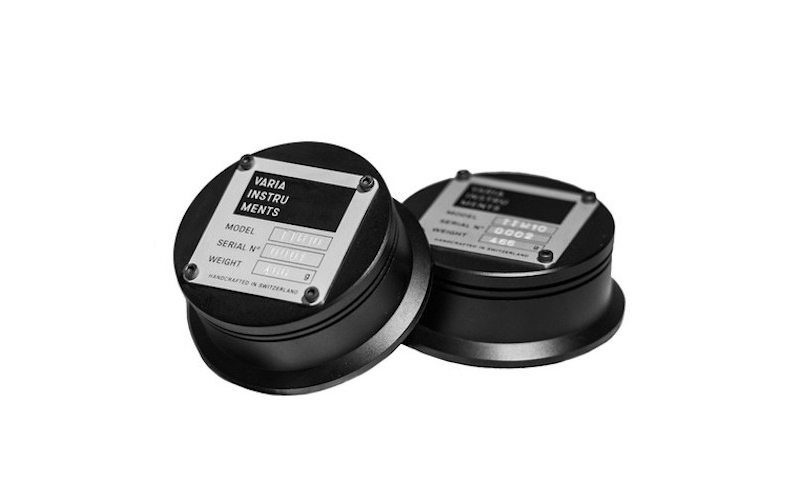 There are a variety of accessories designed to help stabilise records, the most common of which are weights, clamps and, occasionally, periphery rings. While many feel these accessories ‘lift’ the sound, tightening frequencies across the spectrum and subduing any resonance that may occur as the needle tracks the groove of an unsecured record, others feel that they can place unnecessary strain on belts and bearings, producing results too fine to appreciate. However, there’s certainly a science to record stabilisation, and its benefits cannot be denied when it comes to playing warped discs. The additional weight (or in the case of clamps, force) applied to the disc visibly reduces its undulations. If you own a linear tracking turntable (the needle could catch the outer edge if the warp is very severe), prefer a lighter tracking weight, or happen to be playing records in an environment where extraneous vibrations are beyond your control, they can salvage unplayable records and do wonders for sound, especially when reproduced on a large system. If you’re a DJ attempting to scratch, juggle or cue a lighter slab of wax, the mass it gives to the record will give you an extra degree of control as well. Inevitably, the requirements of a vinyl DJ will differ from those of a hi-fi enthusiast. That said, both will find a clamp or weight to be a sound investment. Here is a selection of some of the items currently available on the market. Boasting testimonials from Colleen ‘Cosmo’ Murphy, Gilles Peterson, and DJ duo Bicep, the MasterSounds turntable weight has become a favourite among gigging DJs. Its use is said to promote “improved bass response, tighter mids and controlled highs,” and at a weight of just over 400 grams, is “light enough to not cause damage to a turntable’s bearing system, but heavy enough to give sonic improvement.” According to manufacturers. Bicep praised the additional control it gave them with, ‘old house or disco records pressed on flimsy paper thin vinyl’ – its anti-slip base ensuring optimal control without damaging the label of the record. They also use it when archiving their records for digital use, feeling that it helps achieve a clearer sounding conversion. MasterSound have collaborated with a number of artists and labels since starting out and have become a trusted name within the industry. Our friends at Phonica even have their own. Like MasterSounds, the Swiss boutique company Varia Instruments has garnered acclaim for their meticulously-crafted rotary mixers. 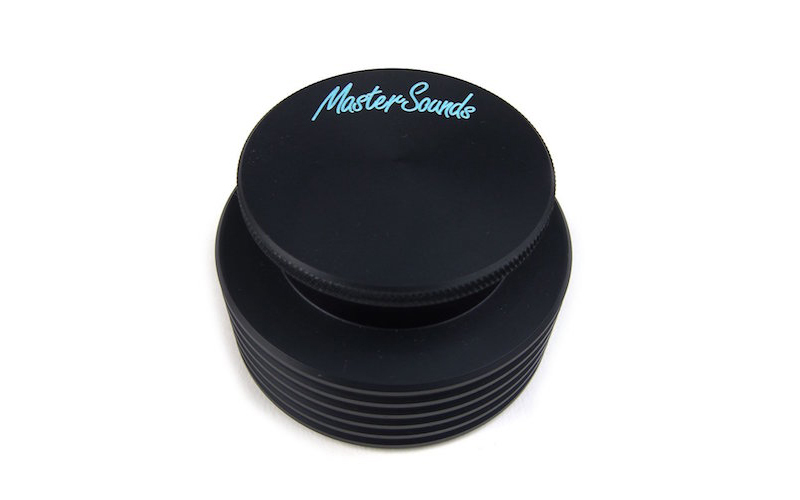 However, its record weight differs from the MasterSounds model, as it also functions as a 45 puck. The underside of the weight contains a moveable brass core, meaning that, when placed upon a standard 12” label, the core is retracted and the weight lies flat upon the label. However, when used with a jukebox 45, the core extends downwards to plug the hole, while the surrounding weight stabilises the disc. It weighs slightly more than the MasterSound model and also boasts an underside coating to ensure optimal control without damaging the record label. If you always turn up to the club with a 45 adapter, or play plenty of them at home and want to add some weight to the equation, it could be just what you need. Record clamps are designed differently to record weights, and as they apply force to the disc and spindle, they needn’t be heavy nor apply additional weight to the platter. The Michell Engineering clamp requires you to place a felt washer around your spindle and placing the record on top, before securing the clamp. 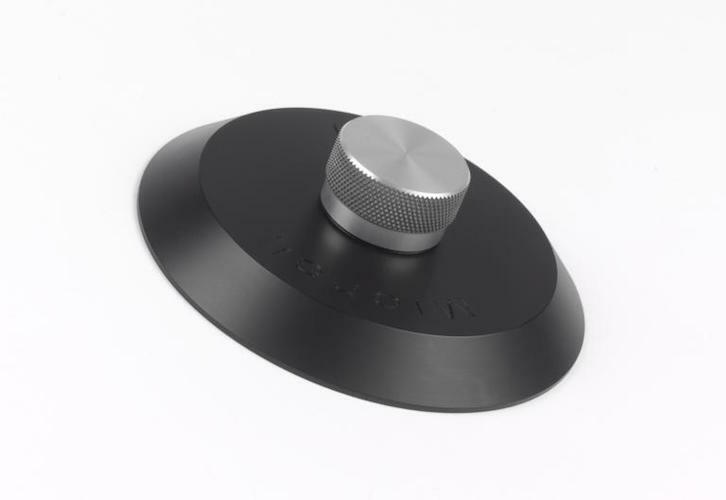 This raises the record above of the platter, so that when you place the clamp over the label, apply downforce with your fingers and tighten the aluminium knob around the spindle, the disc can flex to accommodate the space beneath it. The Michell Engineering clamp is made of a sleek black thermoplastic, with the option of a silver of matte black knob. 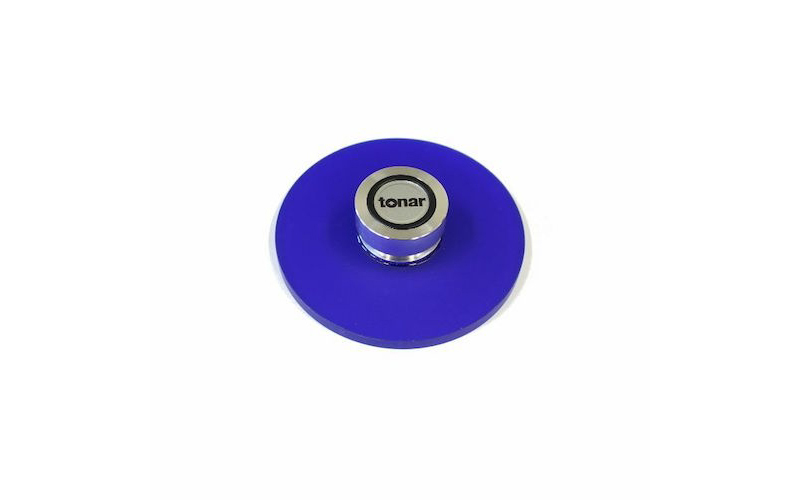 The Tonar plate clamp works just like the Michell engineering clamp, but presents five colour variations, in case you want to match it to your turntable base, or the colour scheme of your listening environment. At 80 grams in weight, it claims to avoid the ‘rumble’ that heavier weights may cause for certain turntable designs. However — as is true for the Michell Engineering clamp — it may not be the best option for DJs, as it takes longer to secure than a puck, which could cut into the time you require to cue the following record. However, if time isn’t an issue, a clamp could be a good choice. This Lou Souther design, unchanged since its development in the 1980s, is a lightweight and cost-effective alternative to the aforementioned weights and clamps. 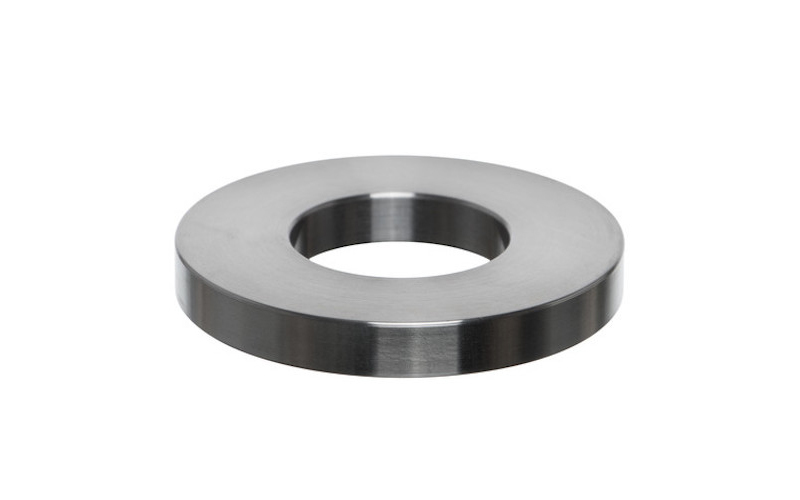 Its square-shaped centre hole may appear too small for the standard spindle, but a snug fit is vital to its effectiveness. A tensioning system, consisting of horizontal indents in the plastic, assist with the mounting and removal of the clamp. The plastic base rests upon the label, gripping the record beneath, and helping to temporarily flatten a warped record, without the equivalent downward pressure of weightier options. Its upturned edges make removing the clamp easy, and its clear plastic finish makes for a very modest design. 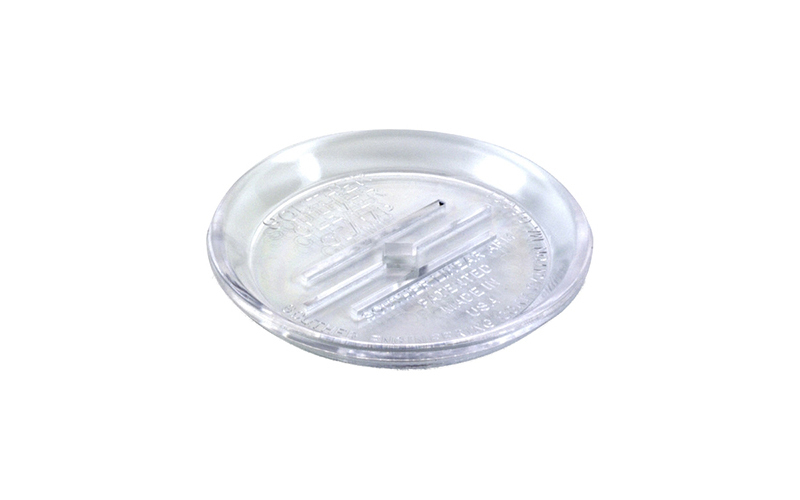 Clearaudio also dish these out with all of their turntables, and consider them a vital part of any vinyl setup. If you’re a DJ predominantly spinning 45s, but you already own a pair of trusty 45 adapters, then the Osmose 7” stabiliser is a great option. It is essentially a cold-rolled steel donut. Your 45 adapter goes around the spindle, you position your record, and sit the stabiliser on the label, flush to the outer edge of the 45 adapter. The density of the material means it can be narrow and low in profile, which is less intrusive for DJs who wish to handle the label or run out groove when cueing the record. Some flat-bottomed pucks that don’t double as 45 pucks wouldn’t work in conjunction with a domed 45 adapter, so this design navigates that problem smartly. A dense, level surface is the first step to great sound, at 280g the Viborg weighs less than the MasterSounds and Varia options. It claims, therefore, to work well with belt-driven turntables, which might not enjoy the greater weight. 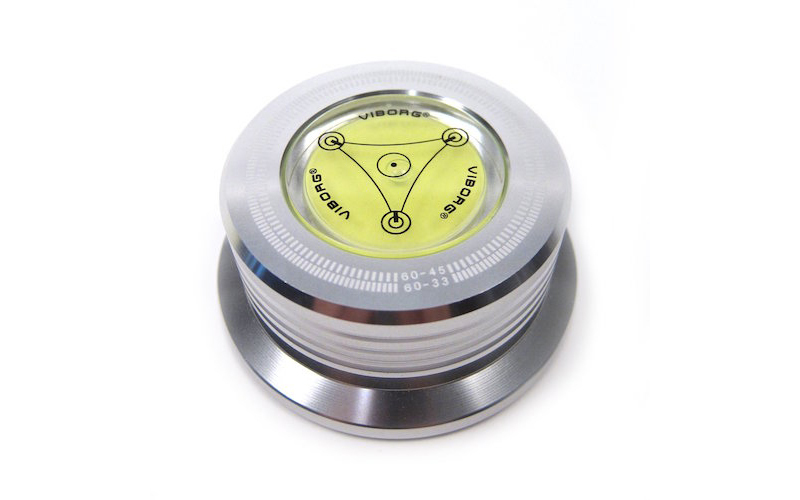 It also has a nifty, 360-degree, dual axis spirit level on top, designed to help you recognise when your turntable is completely level. If you’re setting up turntables at a club, and are able to lean over and take a reading as you adjust the surface, it can do the world of good. Another cost effective alternative. 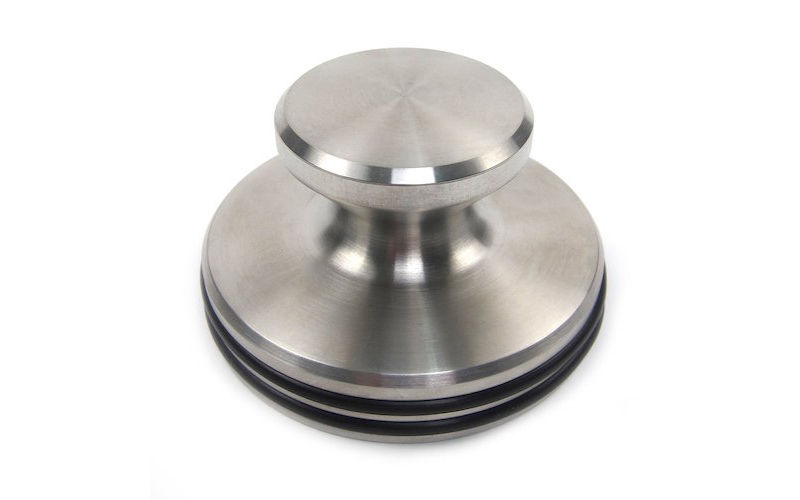 This stainless steel weight is one of the heaviest models available, weighing 800g. The unthreaded design is compatible with almost all smooth spindles, but as is true for several others on this list, threaded spindles may require products designed specifically to be screwed into position. The URSR is something of an outlier on this list, as it isn’t currently available to purchase, and is quite difficult to research online. However, it offers a different design to the widely available clamps and weights, so is worthy of a little attention. The concept behind it is to make the process of record playback closely mimic the process of lacquer cutting. 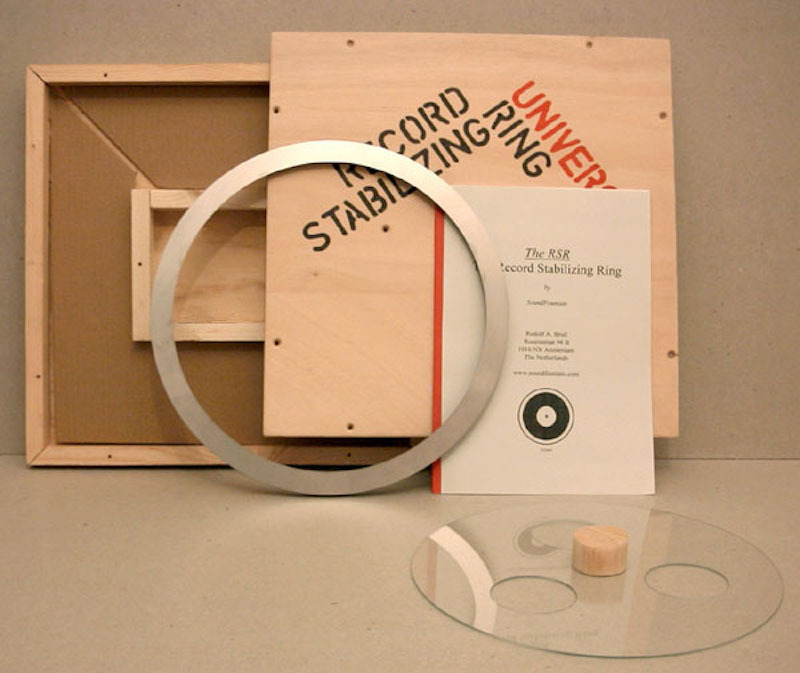 Constructed out of stainless steel pieces, the URSR is a peripheral ring that applies weight to the outer edge of disc and platter, lessening warp and, according to many users, doing wonders for high frequency response in the process. Rudolf A. Bruil copyrighted a ‘universal’ design in 2003 – the 550 gram weight and precise diameter making it suitable for a wide range of turntables. VPI have an outer ring that’s compatible exclusively with some of their turntables, which will set you back a cool thousand pounds. However, the record ring is a design that has apparently been deserted… for the time being, at least.